What homeschool mom doesn’t look for a way to may her day a bit easier? I know that I love when I find a tool or resource that works for my family and eases the load. I recently received a download copy of Early Modern Age (Explorers – 1815); a history schedule from Easy Classical. 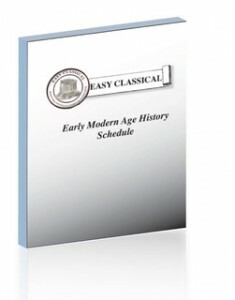 Early Modern Age is a 36 week schedule based on the Classical education method. Each week includes book selections, writing, geography/mapwork, hands on activities and more. Mrs. Williams,author of Easy Classical, also includes a shopping list each week for the week that is coming; what a wonderful help that is! There are also discussion questions given to utilize with the scheduled reading. With this mom can make sure that her students are grasping the concepts and understanding their reading. You could easily use these questions for narration, writing or dinner time dicussions with dad. Mrs. Williams recommends that before beginning with this schedule that you read The Well Trained Mind and have an understanding of the grammar stage of learning. Easy Classical uses this as her guide in compiling her schedule. Early Modern Age is designed for children K-6. All depending on your child’s abilities and stage of learning, you will want to adapt the schedule to meet your needs. Deciding which books may or may not be needed, pick one project or do none at all. Mrs. Williams makes it clear that you should make the schedule work for you; it is a guide not a rule. There is a nice variety of resources used in the Early Modern Age Schedule. You can go here and see the resources that are needed. Some of the books like Story of the 13 Colonies are available to read online. My library had a huge portion of the reading selections like Story of the World, Indian Captive, A History of US, and the Courage of Sarah Noble. There are some resources that would have to be purchases such as; Evan Moor History Pockets, Geography Songs and map outlines.Included on the schedule are some resources written by Mrs. Williams which can be purchased at Easy Classical. Overall, I think that this is an excellent resource for someone who needs help pulling together a classcial approach to their children’s learning. I felt that much of the reading was scheduled on one day and for our family I would spread it out over a few days instead. So simple to adjust that! I think it is helpful that this isn’t just a literature guide/list. Easy Classical provides all you need to have a well-rounded learning experience; literature, hands-on, writing etc all scheduled out for you. It would be especially helpful for someone who had more than one child in the grammar stage. Mrs. Williams also supplies thorough instructions on how to use this schedule in your homeschool. Want to take a peek to see for yourself? You can take a glimpse at the introduction here. You can also look at a sample of the schedule and lesson pages. There are two ways to purchased the Early Modern Age schedule. There is a notebook version available for $35.95 or the download version for $29.95. Want to see what others are saying about Easy Classical? Head on over to the crew! **Disclaimer: As a member of TOS Crew I received a complimentary copy of this product for review. No compensation was made. This entry was posted in TOS Crew Reviews and tagged Books, classical, curriculum, Homeschool, review by sweetie. Bookmark the permalink.